World Cup USA 94 is a football game based on the 1994 FIFA World Cup hosted in the USA. It was published by U.S. Gold for almost every system on the market at the time, including the Sega Mega Drive, Sega Mega-CD, Sega Master System and Sega Game Gear. 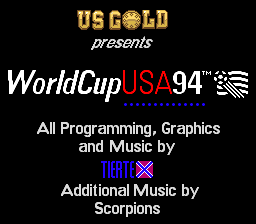 World Cup USA 94 is played from a top-down perspective and features the 24 national teams which qualified for the tournament. In training mode a further eight teams be selected; England, Scotland, Denmark, France, Japan, Portugal, Wales and Australia. Likely to save on efforts localising the game for several languages, many of the menus and on-screen elements are pictorial (e.g. rather than print "throw in" on the screen, there is an animation of a linesman making a throwing gesture). Main article: World Cup USA 94/Magazine articles. Main article: World Cup USA 94/Promotional material.